On 11 November 1918 an armistice was signed, bringing to an end a conflict that had claimed the lives of millions of people. The Great War, as it came to be known, was set in motion by the assassination of the heir to the Austro-Hungarian throne, Archduke Franz Ferdinand by the Serb nationalist Gavrilo Princip. Princip shot the Archduke on 28 June 1914 in Sarajevo, a city in what is now Bosnia-Herzegovina. The assassination precipitated a crisis that simmered throughout July 1914. An ultimatum from the Austro-Hungarian Empire was delivered to Serbia and the Serbian response was deemed to be unsatisfactory, putting the Serbs and the Austro-Hungarian states on a war footing. Due to the alliances that the various European nations had signed among themselves, it was not just the Austro-Hungarian Empire at war with Serbia. Two rival groups of European nations also found themselves on the brink of hostilities. One group was the Triple Entente made up of Great Britain, France and Russia. The other group of nations comprised Germany, the Austro-Hungarians and Italy. They were known as the Triple Alliance. Italy decided to hold back from joining the other two members of the Triple Alliance when war got under way in August 1914. Because of their colonial possessions, both of these groups of nations involved masses of people from across the globe. People from the various colonies, former colonies and dominions in Africa, Asia, the Indian sub-continent, the Americas and Australasia (not forgetting the various European peoples) fought for one or other group of great powers. It was not a war for liberty, democracy or the rights of small nations. It was a war between two groups of imperialist powers, a war to decide which powers were to be the pre-eminent imperialists. Such an understanding of what the Great War was – an imperialist war for global dominance – informs Lenin’s writing in works such as Imperialism, the Highest Stage of Capitalism. It is just this understanding of the imperialist nature of the so-called Great War that is consistently omitted in any of the commemorations held for the centenary of the armistice. Instead, the bourgeois commentary about the conflict has tended to moralise about the tragedy and futility of the conflict while skirting any attempt to analyse why the war happened. The First World War was not just the result of an unfortunate set of circumstances, brinkmanship gone wrong or a failure of diplomacy. It was the culmination of tensions that had their genesis in the changes to capitalism that started in the last decades of the nineteenth century. These changes were identified by thinkers such as John Hobson, the British liberal and staunch opponent of imperialism; Rudolf Hilferding the Austrian born Marxist who wrote about the pivotal role of what he called finance capital in late nineteenth and early twentieth century capitalism. Others, too, added their insights and analyses. Nikolai Bukharin, Rosa Luxemburg and numbers of other Marxists including the leader of the German Social Democratic Party Karl Kautsky, contributed to the discussions about the developments in capitalism and its intimate relationship with militarism, colonialism and great power rivalry, in short, with imperialism. These analyses of capitalism in its monopoly phase and imperialism were summarised, criticised and developed further by Lenin in his Imperialism, the Highest Stage of Capitalism. In this major work, written while the Russian army was fighting with German and Austro-Hungarian (and Turkish) forces on the Eastern Front, the direct connections between monopoly capitalism, imperialism and war were starkly outlined. For Lenin, inter-imperialist rivalry and war were the unavoidable products of the developments in global capitalism that had occurred in the decades since Marx died. The political lesson Lenin drew from his research into imperialism was that the only way to break the drive to imperialist war was socialist revolution. The ‘war to end all wars’ was an imperialist war; it happened because rival groups of imperialist nations resorted to armed conflict in order to secure the dominant position in the pecking order of nation states. Here in Australia the Great War still casts a long shadow. Australian and New Zealand troops were sent to fight for the British Empire soon after hostilities broke out. Official Australian rhetoric at the time played up issues such as the violation of Belgian neutrality by the German army, supporting the Mother country and so on. After the war, the whole ANZAC/ Gallipoli nation building myth has been used to inculcate generations of Australians into believing that the killing and maiming of many thousands of their soldiers for British imperialism was somehow a noble sacrifice. Two failed conscription referenda showed that a lot of ordinary Australians at the time were sceptical of claims made by governments about the war. The majority of the Australian population were not convinced that more sacrifices for the war effort were necessary. The 1980s marked the start of a concerted campaign to revivify the ANZAC myth. During the 1960s and ‘70s ANZAC Day and commemoration of war had become less popular due to mass opposition to Australian involvement in the Vietnam War. In an effort to counter this distaste for militarism, both Labor and Coalition Federal governments have seen fit to promote ANZAC day as a nation-forming and unifying event. The centenaries of battles that ANZAC troops fought in during the war have received copious amounts of attention and public funding. Every opportunity is taken at public memorial services to have representatives from the various branches of the armed forces present. 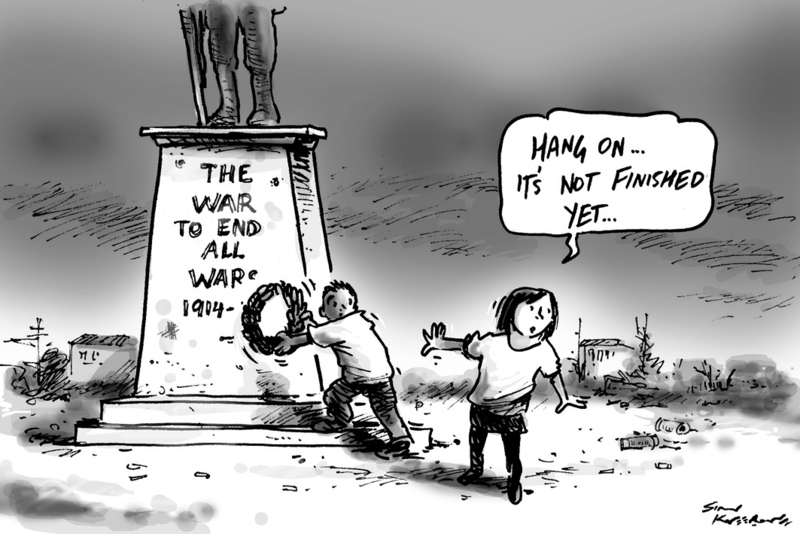 What is being done with the promotion of ANZAC Day and the various commemorative services associated with the Great War is the normalisation of militarism. The lessons of the Great War are not drawn out by bourgeois commentary. The imperialist nature of the ‘war to end all wars’ is not mentioned. The fact that in 1919, the victorious imperialist powers imposed punitive and financially crippling peace treaties on the losing powers leading to misery for the working classes of those countries is passed over. These punitive peace treaties sowed the seeds of another war; fascism started to raise its brutal head. Out of the carnage and bloodshed of the First World War there appeared one beacon of hope for the working people of the world. That beacon of hope was (and remains) the Great October Socialist revolution. The working people and their allies in Russia fought through two revolutions in 1917, with the second one in October delivering into the hands of the working class state power. It is their attempt to build a better world based on socialism that is inspirational and worth emulating. Far better that than bourgeois mythologising and moralising about the ‘war to end all wars’.